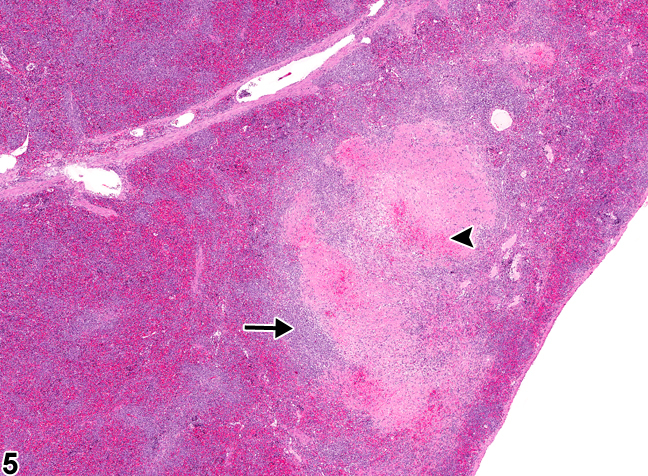 Spleen - Necrosis in a male F344/N rat from a chronic study. A large necrotic focus (arrow) is present with the spleen. 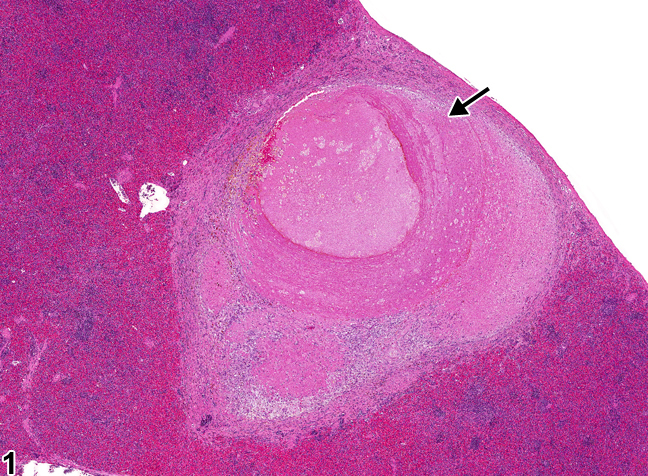 Spleen - Necrosis in a male F344/N rat from a chronic study (higher magnification of Figure 1). 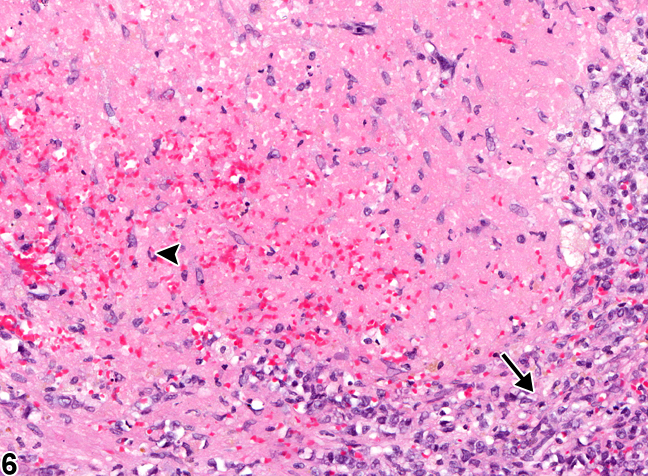 Necrosis is bordered by foci of hemorrhage (arrowhead) and fibrous connective tissue (arrow). 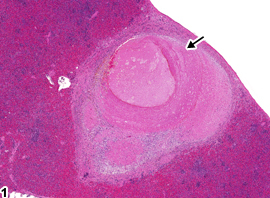 Spleen - Necrosis in a male B6C3F1/N mouse from a chronic study. 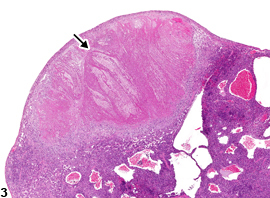 A large necrotic focus (arrow) is present with the spleen. 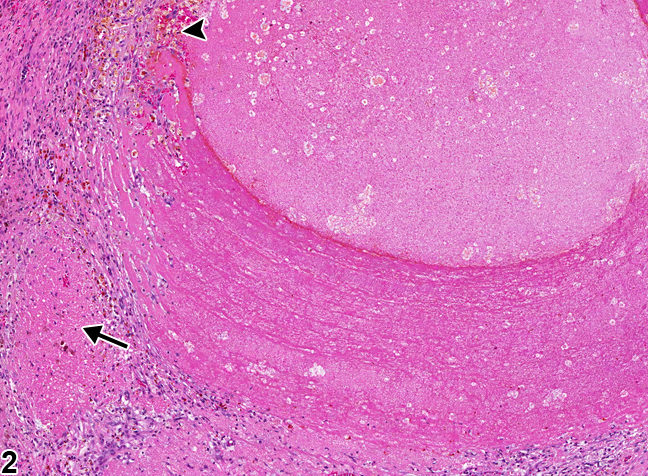 Spleen - Necrosis in a male B6C3F1/N mouse from a chronic study (higher magnification of Figure 3). 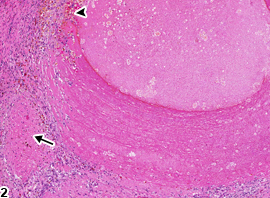 The necrotic focus is bordered by a mixed inflammatory infiltrate (arrow), fibrosis (arrowhead), and dilated blood vessels. Spleen - Necrosis in a male F344/N rat from a chronic study. A large necrotic focus is present within the splenic red pulp, with focal areas of associated hemorrhage (arrowhead) and bordered by an inflammatory infiltrate (arrow). Spleen - Necrosis in a male F344/N rat from a chronic study (higher magnification of Figure 5). The necrotic focus consists of necrotic cellular debris, degenerate neutrophils, and hemorrhage (arrowhead) and is bordered by a rim of histiocytes, lymphocytes, and fibroblasts (arrow). Splenic necrosis ( Figure 1 , Figure 2 , Figure 3 , Figure 4 , Figure 5 , and Figure 6 ) may be induced experimentally in rodents; however, this lesion is more often associated with vascular obstruction, trauma, or neoplasia. 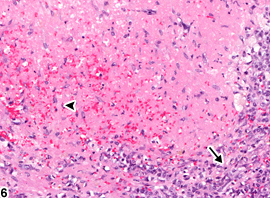 Expansive necrosis can be associated with a thrombus or neoplasm in the spleen. Necrosis of splenic constituents is characterized by cell swelling, condensation and dissolution of the nucleus, and cell lysis with accumulation of abundant eosinophilic cytoplasmic and karyorrhectic nuclear debris. Inflammation, hemorrhage, fibrin, fibrosis, and/or mineralization may accompany splenic necrosis. Whenever present, necrosis of the spleen should be diagnosed and assigned a severity grade. If splenic necrosis is secondary to a lesion such as thrombus or neoplasia, it should not be diagnosed but should be described in the narrative. 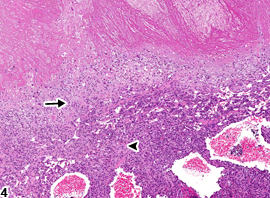 Secondary lesions, such as inflammation or hemorrhage, should not be diagnosed separately unless warranted by severity, but should be described in the pathology narrative. Elmore SA. 2006. Enhanced histopathology of the spleen. Toxicol Pathol 34:648-655. National Toxicology Program. 2002. NTP TR-523. Toxicology and Carcinogenesis Studies of Diisopropylcarbodiimide (CAS No. 693-13-0) in F344/N Rats and B6C3F1 Mice (Dermal Studies). NTP, Research Triangle Park, NC. Stefanski SA, Elwell MR, Stromberg PC. 1990. Spleen, lymph nodes, and thymus. In: Pathology of the Fischer Rat: Reference and Atlas (Boorman GA, Eustis SL, Elwell MR, Montgomery CA, MacKenzie WF, eds). Academic Press, San Diego, 369-394. Suttie AW. 2006. Histopathology of the spleen. Toxicol Pathol 34:466-503. Ward JM, Mann PC, Morishima H, Frith CH. 1999. Thymus, spleen, and lymph nodes. In: Pathology of the Mouse (Maronpot RR, ed). Cache River Press, Vienna, IL, 333-360.